I eat a lot of soup in the winter, making a pot once or twice a week depending on what’s on hand and my mood. 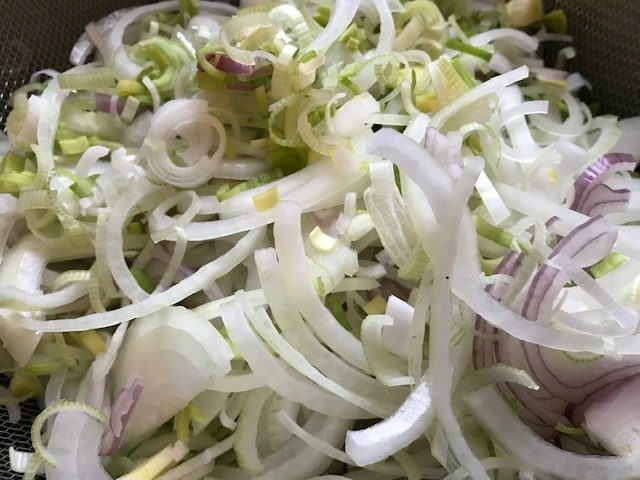 A few favorites are periodically repeated, but there are so many soup recipes out there, more often I try something new. Of course, “something new” could be a different recipe for something I know we like. French Onion Soup falls under that category. 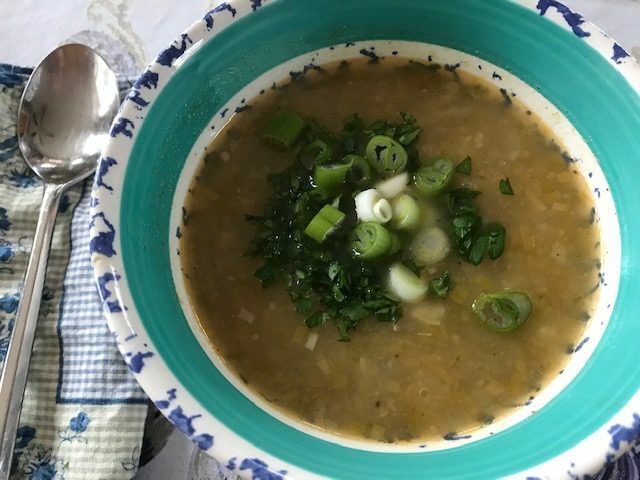 This week’s selection for Cook the Book Fridays is David Lebovitz’s version of this classic soup from his book My Paris Kitchen. French onion soup is one of those soups where the quality of the underlying broth is key. David’s version calls for chicken broth. I had a turkey carcass in the freezer which was close enough. I got a start early in the week, making a batch of turkey stock in the slow cooker. I love making stock in the slow cooker. I can comfortably come and go while it simmers away safely without any attention required. And when I do leave the house, the aroma on returning is magnificent. 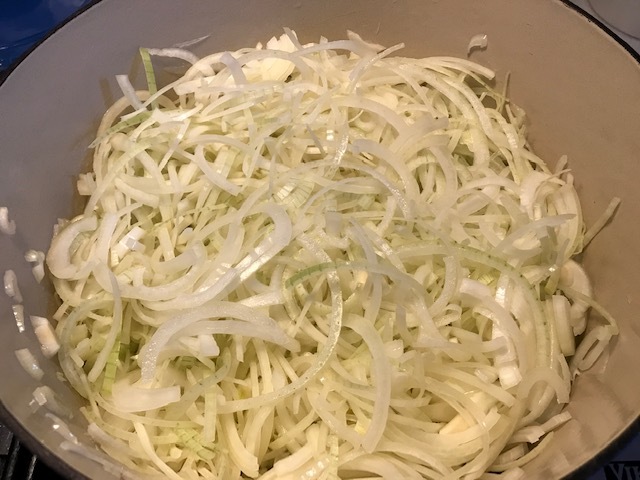 To balance the lack of attention required by the stock, caramelizing the onions for the soup calls for two hours of frequent attention. 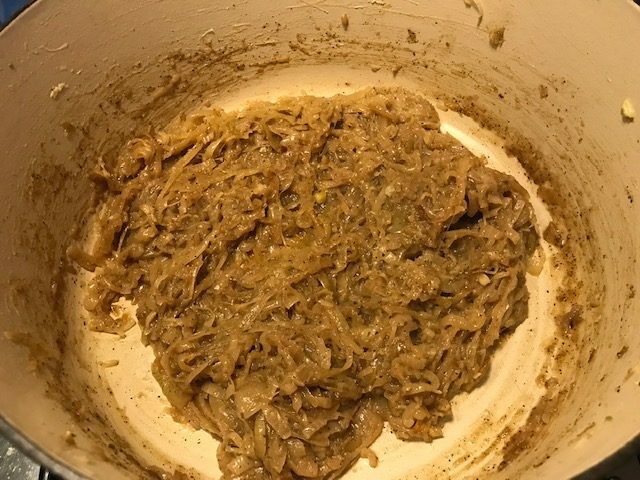 Two pounds of onions melt away to a surprisingly small pile of fragrant mush. At this point, the rest is again hands off. The onions simmer in the stock for nearly an hour before balancing the flavors with sherry vinegar, salt and pepper. The finishing touch are the cheesy croutons that top the soup. For my bowl, I topped toasts (made from Mardi’s No Knead French Bread) with Emmenthaler cheese and broiled it. Howard prefers the cheesy toasts on the side, so I also broiled some standalone toasts on the pan alongside my bowl of soup. Everyone was happy! 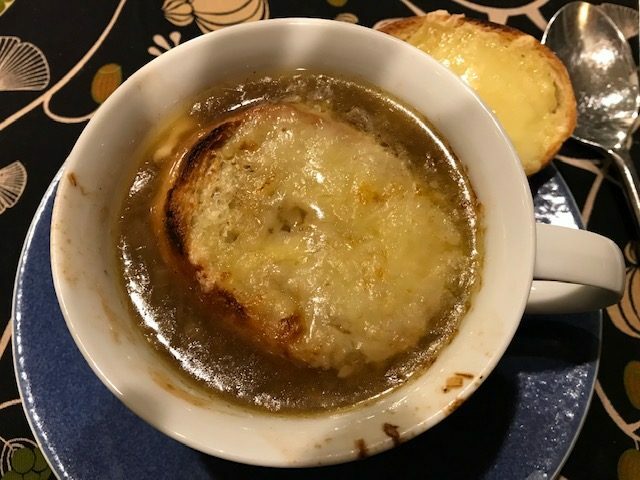 This version of French Onion Soup was delicious, though it wasn’t noticeably different from other versions I’ve made. I suppose that’s the thing with a classic – as long as the familiar flavors come through, it’s reliably good regardless of the recipe. Last month, I made this completely vegetarian version from Serious Eats without any stock, just water, which we also loved. The only downside of making onion soup is that my house always seems to smell skunky for the next day or so. Does that happen to you? 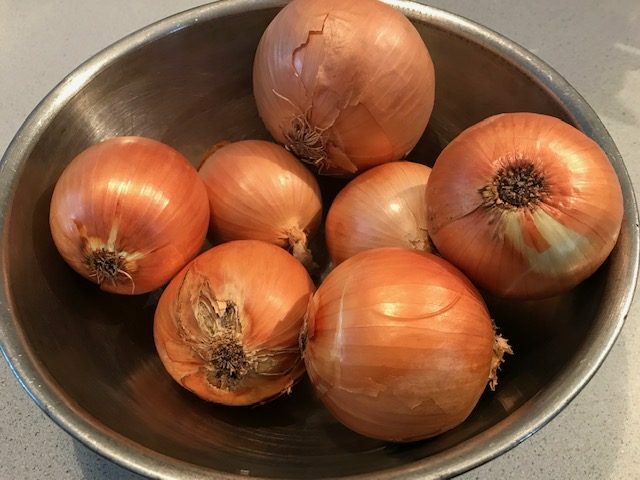 If you’re in the mood for French onion soup, this recipe is found on page 118 of David Lebovitz’s My Paris Kitchen. And you can visit Cook the Book Fridays to see their comments on David’s recipe.